Ask About Discounted rates for stays over 7. 14 and 21 days!! A unique property with Direct Ocean Front so close you can watch the turtles below your deck. See the boats go sailing by. Watch the surfers and take in the magnificent views and peaceful surroundings… The extended lanai is perfect for a romantic evening! 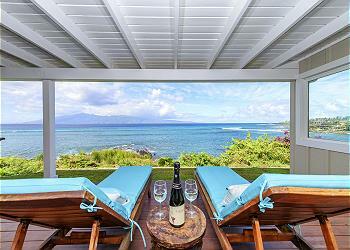 A gated ocean-front community, it promotes open space and an old Hawaiian residential feel. The home has been professionally refurnished with all new furniture in the living room and dining area and we have a large 60-inch Smart TV for nights you want to relax and watch after long days at the beach. This 3-bedroom, 2-bath home has been renovated with a large deck with Fleetwood pocketing doors, wood floors, large walk in showers and a soaking tub. The Master Bedroom has majestic views and pocket doors that lead to the lanai and the en-suite master bathroom soaking tub shares the same views! Master Bedroom Features King Bed and TV with a lounging chair that turns into a twin sleeper in case little ones need to be near Mom and Dad. Guests room features a King Bed with TV and Plantation Shutters to let the sun in. Third bedroom has a NEW sleeper sofa with an 8 inch memory foam mattress and TV for the kids to hang out in and watch movies. Can be made up as a Queen bed in advance for guest. Fully Equipped Gourmet Kitchen with breathtaking views as you prepare your meals. Outside BBQ for your use. A nice carport to store all of your outdoor toys and keep the sand out of the house. Parking for 2-3 cars ,Washer and Dryer onsite for your use. Walk down to the beach cove for snorkeling with the turtles, lay by the heated saline pool or walk through the mango groves and you have easy ocean access, surfing at Little Makaha. This community offers a relaxing ocean side saline pool area and it includes free wifi and bathrooms and a fresh shower for you to use. Bring your lunch to the pool and picnic on the porch at the club house. This beautiful Alaeloa complex exudes Hawaiian charm with an Old Hawaii feeling. Come experience this hidden gem. Many say, "Alaeloa is not just a place, but a state of mind”.